This section illustrates how to retrieve historical data for different instruments. A list of instruments for which historical data is available is returned by con. get_instruments_for_candles(). In a simple case, the con.get_candles() method returns the most recent data points available for a specified instrument and period value. By default, the method returns a pandas DataFrame object which simplifies the majority of typical analytics and visualizations tasks significantly (see http://pandas.pydata.org). The parameter period defines the frequency of the data to be retrieved. Below is a list of all currently available frequencies. By default, con.get_candles() returns data for the last 10 available periods, depending on the parameter value for period. A number different from 10 can also be defined via the number parameter. Alternatively, one can specifiy start and stop values to specifiy the time window for data retrieval. 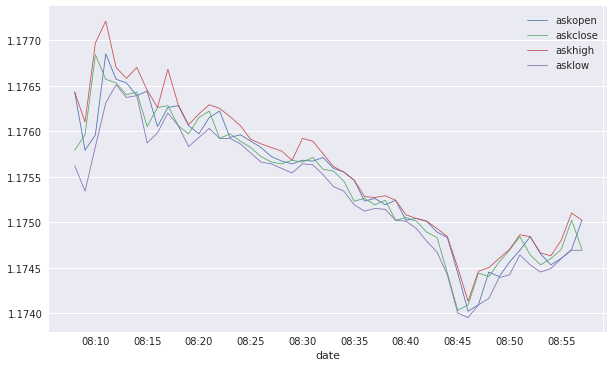 The Python ecosystem provides a number of alternatives to visualize financial time series data. The standard plotting library is matplotlib (see http://matplotlib.org) which is tighly integrated with pandas DataFrame objects, allowing for efficient visualizations. Using the columns parameter, one can specifiy which data columns are returned. Here, just one column is specified. 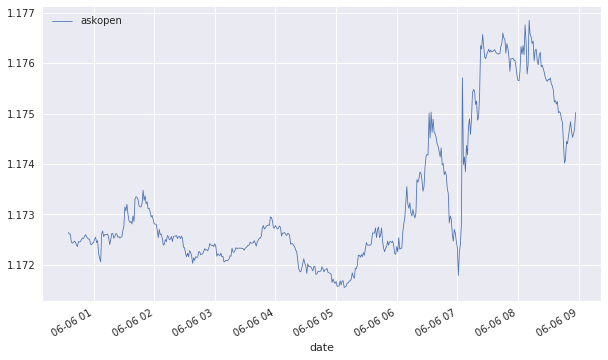 The following code visualizes the only financial time series in the DataFrame object. Specifying the columns parameter to be asks (bids) returns all columns related to ask (bid) prices.